This is our custom-built Adapter or Specialty Miniature cable. Construction is Neutrik connectors with Mogami 2697 cable. Neutrik connectors are some of the best connectors around. Mogami 2697 is a balanced "microphone cable" style cable and is very flexible, durable, light-weight cable. 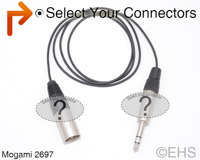 Mogami 2697 "miniature" wire is a great pick when a larger wire size is a problem, like when connecting to lavalier mics. This is the thinnest balanced cable we sell at .098" thick. Don't let its size fool you; it is an excellent cable with 28 AWG conductors and a wrapped shield. Though because of the thin conductors, it would be best to limit the length of the cable. Flex life is 49,000 cycles (which is very good). Photo 1 shows 4' cable with XLR male and TRS 1/4".